Editor’s note: This is the first installment of Transformations, a weekly MaxPreps feature that reveals the role of high school sports in transforming lives. 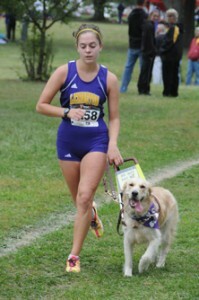 Ohio runner Sami Stoner and her guide dog Chloe have become an inspirational story. Courtesy photo. Sami Stoner, a creative, outdoorsy and studious sort, never imagined herself a homecoming princess. But there she sat, in front of the entire student body of 900 at the Lexington (Ohio) High auditorium last Friday, dressed in sequins, jewelry and fitted, flowing formal attire. On her lap was a covered box filled with three roses, and if colored red, she would be crowned the queen, a fact completely lost to the humble 17-year-old senior who simply took in the moment. But how could she? How could she have fathomed any of the last four years? As an eighth-grader she was diagnosed with Stargardt’s disease, a hereditary form of macular degeneration that causes irreversible blindness. Stoner can see slightly peripherally, but everything straight ahead is dark and blurry.